Could someone please demonstrate how the 2 resistor values are calculated for this section of a midi to cv converter. I have read in some places that the 220ohm at the input is recommended but I can't see that anywhere in there 6N139 data sheet. Also, I have read somewhere that hysteresis has something to do with it ? The voltage over the LED in the 6N139 takes typ. 1.4 volts, that leaves you with 3.6 volts (providing you supply with 5 volts). Abs. maximum forward current is 25mA, so stay away from that, while the input current can be as low as 0.5 mA, the example in the datasheet states 1.6 mA. Usually the send side has two resistors of 220 ohm each. So a total of 660 ohm over 3.6 volts, gives a current of about 5.5 mA, well below the max. input current and high enough to ensure fast switching. My guess is that somebody tried it and it worked. Looking at this design by petegaggs. There is a 220Ohm resistor at the input and a 220 Ohm resistor at the DAC output. Are these the only 2 resistors that are calculated? or am I missing a component? There is no 220 ohm resistor at the DAC. Look at the schematic I posted earlier: there are three 220 ohm resistors: one at the input (pin 4 of the MIDI in connector, one at pin 4 of the MIDI out connector and one at pin 5 of the MIDI out connector. So the current flows from the +5, thru 220 ohm into pin 4 of MIDI out, going to pin 4 of the MIDI in, thru the 2nd 220 ohm resistor, thru the opto-coupler (2>>3) into pin 5 of the MIDI in, out to pin 5 MIDI out connector, 3rd 220 ohm resistor, thru the 2N2222 to GND. So, 3 x 220 ohm and the voltage over the led in the opto coupler. 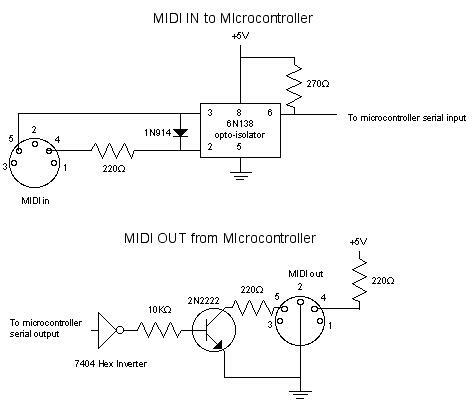 Apologies, the schematic for a project that I am referring to does not have a MIDI through. I have attached it to this comment, and it is just a standalone experiment that I am trying to learn from. 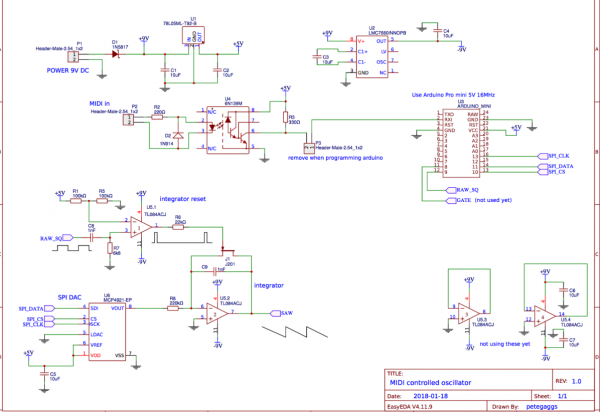 would the schematic you sent still relate to this? Yes, it still relate to your "problem", all I did was showing a schematic with the top half would be the "standard" midi input, just like the schematic you posted, and the bottom half will be much like a "standard" way to have a midi out on an Arduino or the likes.